Remedy for stomach and back pain at the same time. 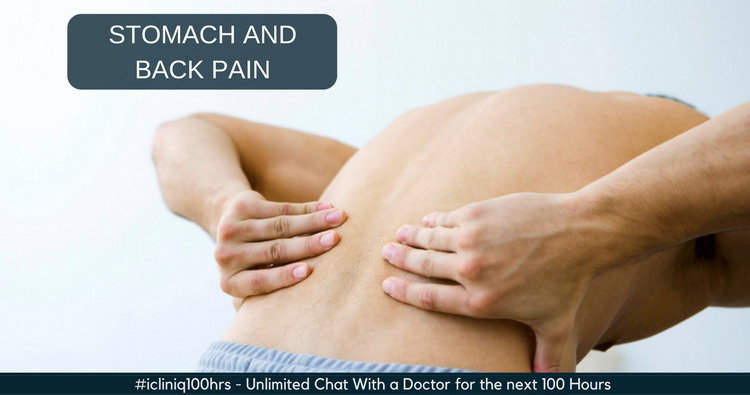 iCliniq › Ask a doctor online › Answers › Internal Medicine › Stomach Pain › I have severe stomach and back pain at the same time. Can you Suggest any quick remedy? I have severe stomach and back pain at the same time. Suggest some quick remedy. • I have stomach pain when I pass stools. Please suggest a medicine. • Tests for stomach pain revealed a high eosinophil count. What to do? I have read through your query in detail. Please find my observations below. Severe pain in abdomen radiating to the back might be due to many conditions which require evaluation. Due to Acidity:- It is important to know if you have gastritis which was diagnosed earlier or if your meal timings are not proper. In this case the pain in abdomen might be due to acidity. Usually taking antacid formation medicine like Pantoprazole 40 mg on empty stomach reduces this pain. Please visit your doctor and they will give you a prescription of Pantoprazole if required and take in recommended dose. Kidney Stones:- If the pain is along the sides and going down along the back then it might be related to kidney stones. This requires confirmation with ultrasound scan followed by treatment. Stones in Gall Bladder:- Such a pain might also occur due to stones in gall bladder and will be known by doing ultrasound scan. Pancreatitis:- Pancreatitis might also cause this kind of pain and your doctor might suspect only after clinical examination. There are particular blood tests to be done if pancreatitis is suspected. Small intestinal infection:- Small intestinal infection is also an important cause for this type of pain anywhere in the abdomen. Due to Appendicitis:- Right lower abdominal pain is commonly due to appendicitis. For spasmodic pain you can take antispasmodic medicine like Spasmonil plus (Dicyclomine hydrochloride and Mefenamic acid). This has to be taken twice daily for pain that might be a spasm. This should reduce any spasmodic pain that you are having. Once pain is stable then please consult your doctor and get examined clinically. If required the doctor might ask for an ultrasound scan abdomen to be done to know the cause. Above mentioned causes are the commonest and there are many other conditions which might cause a similar pain. Clinical examination and investigations are important.